As you start prepping the carrots for the soup, start the stock. It is well worth the extra few minutes. Put a pot of water on a burner and add the roughly chopped vegetables, carrot tops and peels, and bay leaf. Bring to a boil and simmer for at least a ½ hour (longer if you can wait) as you prep the other soup ingredients. When you are add the stock to the soup, drain the roughly cut vegetables and bay leaf. 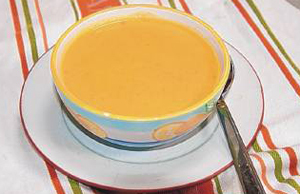 To prepare the soup, heat olive oil over med-high heat and add onions, carrots and sunchoke. Stir occasionally and cook until carrots are mostly tender. Add grated ginger and stock. Bring to a boil and let simmer until carrots are tender, especially if you use a stick blender. Remove from heat. Puree the soup. Return soup to pot if you have transferred it to puree. Stir in the light cream, salt and pepper to taste. Adding dill will speckle the creamy soup’s orange color.